Tags: Eating Abroad, European Food Culture, Food Adventure, Food Safety, Restaurants, Rome. 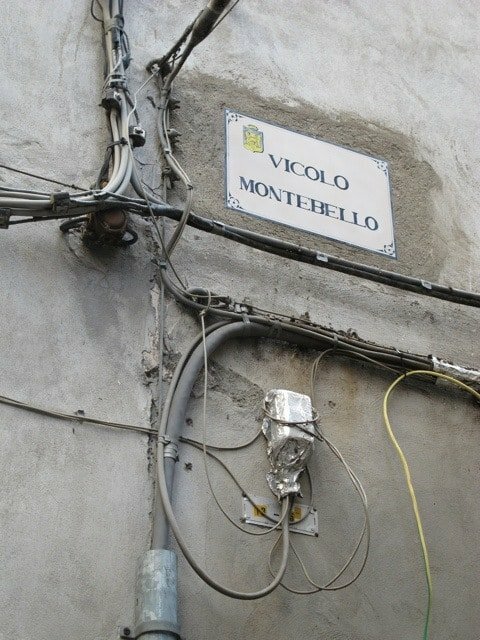 I was lucky enough to visit Rome a couple of weeks ago. 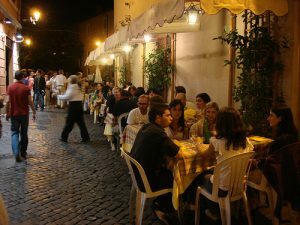 One warm evening as I sat out on a quaint cobbled street sipping on a cocktail, eating the most fantastic soft salami focaccia sandwich I’ve ever tasted (top 10 food highlights of my life! ), I wondered why I can’t quite have this feel and experience in SF. We have incredible restaurants here, with unparalleled food talent and a uniquely SF vibe that I love. We take such pride in our work, and really focus on our product and ideas. Yet this particular feel is just not possible to get in SF. No doubt the lack of hot nights plays a huge part. The entire restaurant was practically outdoors. Servers were doubling as magicians whipping out tables and settings as soon as customers strolled by. The world cup played on the outdoor rigged cute TV hooked up with numerous extension wires. Small plates of delicious food came out of the tiny restaurant/bar to cheering fans. No doubt, the weather, the fashionably dressed people, the beautiful architecture and cobbled streets with potted plants and herbs all added to this uniquely Roman Experience, but a lack of rigid rules was a huge driving force that I was truly loving. Given that my world is entirely consumed by running restaurants, whenever I visit one as a customer, I can’t help but process the experience from a SF restaurateurs perspective. So much of this experience would have been shut down. I must preface my next few sentences with the fact that I completely understand that rules and regulations are mostly set up for our safety and to avoid chaos. Yet sometimes they kill a certain beauty of experience and pleasure. I’m sure this is highly unpolitical of me to say, but….. the US really may have over regulated the dining experience. The outdoor seating permits, rules and regulations would have nixed most of the outdoor experience. At most a couple of tables MAY have been allowed. Residents would have gone completely ape s…t at having all of this action going on in their streets. DPW would have possibly combust at the idea of streets being blocked and yet somehow cars and motorcycles were making it through though and I might add, in a rather scary fashion. I’m not quite sure which department would have had a heart attack with the electrical dangers of the TV setup, maybe the fire department would have a lot to say about potential fire hazards of the dangerous electrical circuitry. Charming electrical wiring art on the walls of ancient buildings. No doubt someone would have been sued by tripping on a wire, although it would have been hard to say who, as so many restaurants and bars were sharing this one TV. The building department may not have allowed the restaurant to actually open in the first place, as the restroom was almost non-existent. And as for the health inspectors!! They would be appalled. None of that food was being stored at either high enough or low enough temperatures, and there was certainly no sneeze guard protecting all the food out in plain sight at this particular restaurant, which means communicable diseases from literally coughing and sneezing on food could have been spread. I laughed in my head, and fully knowing the hazards of food holding at dangerous temperatures, still decided to go ahead and eat and have a good time. It was nice to know that I was allowed to make this choice for myself. 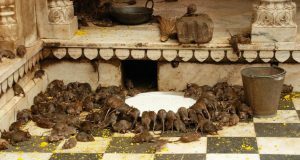 This is just Italy, imagine India:) Check out this link of a rat temple. An absolute extreme yet fascinating example that really makes me smile. What would the West make of this. Eating with the Rats!! Karni Mata Temple: It’s actually considered a blessing to eat food that has been nibbled on by a rat.